"The Rhythm of Nature is our engine"
Words and photography by Barry Macdonald When I was told about the concept of transporting cargo from the Caribbean by sail power only, I couldn’t imagine how it would make sense against modern ships. The more I listened, I learned that most container ships don’t move so quickly, a nimble sailing ship on the trade winds is not much slower. The big difference lies is in the pollution they emit. The 15 largest ships in the world pollute as much as all the cars in the world. These include cargo and cruise ships that burn cheap heavy fuel oil, described as the dregs of the refinery. The shipping industry is responsible for around 90% of the worlds cargo trade. Most conversations on pollution normally revolve around driving or flying, but consideration to the consumer goods like food, clothes and electronics, we buy every week is rarely given. This situation is what prompted three friends in 2007 to create Fairtransport in the Netherlands, a zero emissions cargo company powered by sail only. They purchased the Tres Hombres, a 1943 Brigantine minesweeper and refitted her to carry 35 tons of cargo. 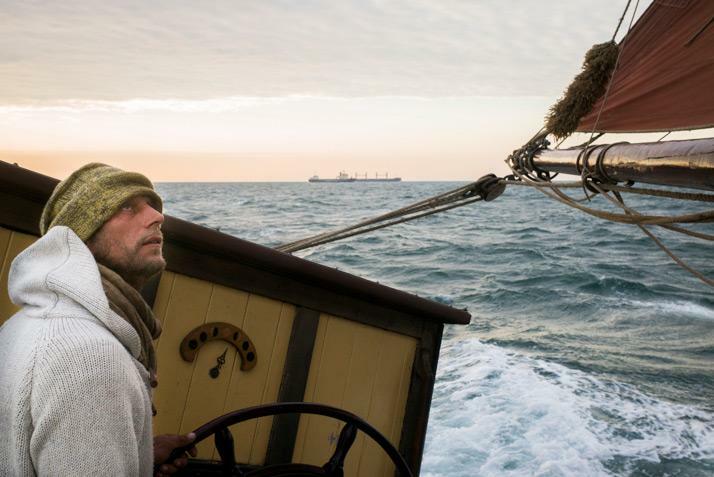 By 2009 they started sailing across the Atlantic Ocean bringing back Rum, Coffee and Chocolate from Northern Brazil, Grenada, the Dominican Republic and Barbados. When back in Europe, via the Canary Islands, they deliver to Portugal, France, England, Spain, Germany, Holland and Denmark, also trading in European wine and olive oil. The company is committed to sailing cargo emission free focussing on products that are organic, fairly traded or crafted traditionally. They personally meet all of the growers, suppliers and buyers at every step to ensure they can guarantee the products they are delivering. The Tres Hombres was the world's only engineless cargo ship, until they purchased the Nordlys, an 1873 fishing boat. They refitted her to take 30 tons of cargo in 2015. She is now possibly the oldest working engineless cargo ship in the world, doing 3 trips around Europe a year. I joined the Nordlys in Blankenberge, Belgium where she was unloading wine and olive oil from Portugal. The crew of 8 consisted of their Dutch Captain Lammert, First Mate (Belgium), Cook (Belgium), 3 Deckhands (2 French, 1 Belgium) 1 passenger (A lovely lady from Belgium who wanted an adventurous holiday, so had paid to sail for 12 days) and myself. Everyone is bi or tri lingual and English is the common language of the ship. 9 is the maximum and 7 is the minimum crew to sail. We had to wait an extra day for a storm to pass and then were pulled out at 14:00 by the local rescue boat, tug boats are hard to find when every sailing ship has an engine to come in and out with. 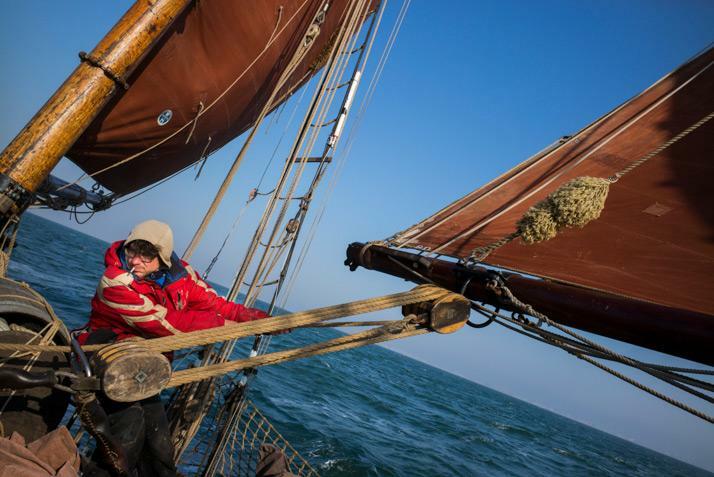 Leaving the harbour is the time of most action, with all hands on deck, the sails need to go up in the right order, at the right time, so we sail straight past the dangerous shallow sand banks. When a rope or a sail is stuck there is a quick sharp dialogue between Captain and crew, always factual and to the point, and never once with any temper and then fast action to form a resolution. The Captain and First Mate are in charge of the two watches. We work 6 hour shifts in the day and 4 hours at night. So it’s 08:00-14:00; 14:00-20:00; 20:00-24:00; 24:00-04:00; 04:00-08:00. Each watch is therefore woken up 5 times in 48 hours, (7:15, 13:15, 19:15, 23:45, 03:45). 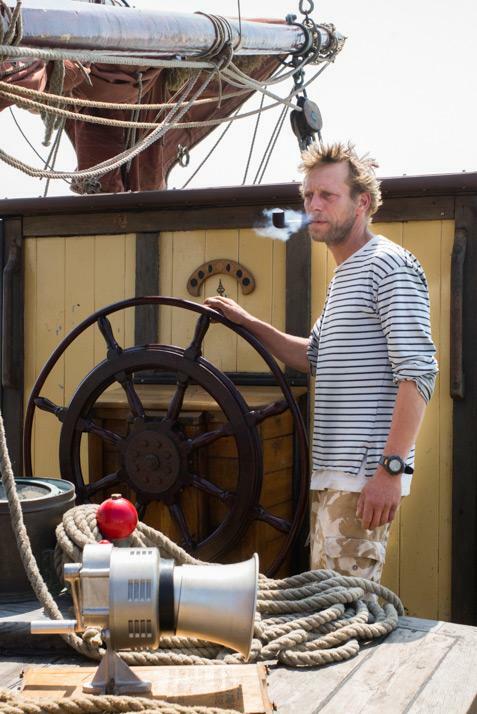 The cook is the only person excluded from the watch system, he has to cook the 3 meals a day to fuel the crew. My first watch is at 20:00 so the captain sends us to bed at 18:00. The captain has his own cabin in the aft (back), the rest of us sleep in the fox hole in the bow (front) of the boat. A narrow ladder drops you into this small wonky triangle of 8 bunks. The space is dark and musty, a mixture of old socks and salty rain gear soaked into the wood. Your bunk provides you just enough space to sleep flat, and you have a small wooden chest for your clothes. Spare rope, the ships anchor chain and dry food all are stored here under the floor as well. When the ship is sailing your bunk is constantly moving with the bow cutting through the waves, sleeping below the waterline means there is a constant noise of the sea swirling around, it’s a bit like sleeping in a washing machine at first. We are woken at 19:15 for dinner before the shift, a mist descends on the boat and we sail through the darkness of the Channel only being able to see about 150 feet away from the boat. We keep our eyes and ears open for any ships or buoys, your eyes play lots of tricks on you at first, I even thought I saw an iceberg at one point! A huge ship is sounding its fog horn at 2 minute intervals, but we can’t see it, the computer tells us our courses will not meet. We wake the next watch at 23:45 and make tea and coffee for them, we swap watches by the wheel at the aft and Captain Lammert gives a status update, it’s always positive, no matter how much we have moved. My watch sleeps at 24:00 and is woken at 03:45. I still haven’t slept at this point because of the noisy fox hole, the wind is incredibly cold if you are not wearing enough of the appropriate layers. I cannot understand why the crew endures such hardship. 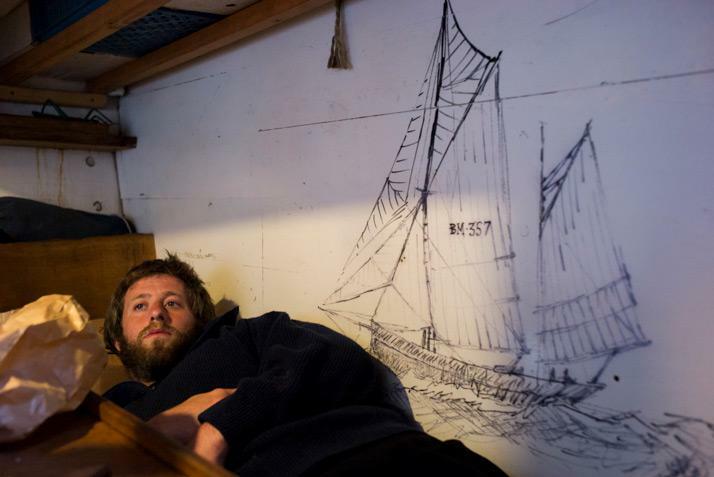 It’s hard manual work for every rope, a total lack of privacy or free time while at sea, sleeping is hard in the fox hole, the toilet is in a small cupboard on the back of the boat, and hard shift patterns mean you are lucky to get 5 hours of sleep. Working the watches makes 2 days feel like 4 or 5. The longer we sail I start to understand why these sailors endure these difficult conditions, for pay that is below what they could earn on engine powered cargo ships, for much less work. The power of the ship when all 5 of her sails are raised is a phenomenal experience, the sailors are tuned into the wind direction, the current and tides. As the wind changes they let the sails in or out to always harness as much power as possible, they all glance up occasionally checking the sails are full and taught. All of the people on board come from different backgrounds and have a wide spectrum of personalities, but they are all linked by a love of “real” sailing and a concern for the environment. The crew has to spend a lot of time together, and all rely on each other for their safety when they are alone in the middle of the ocean. 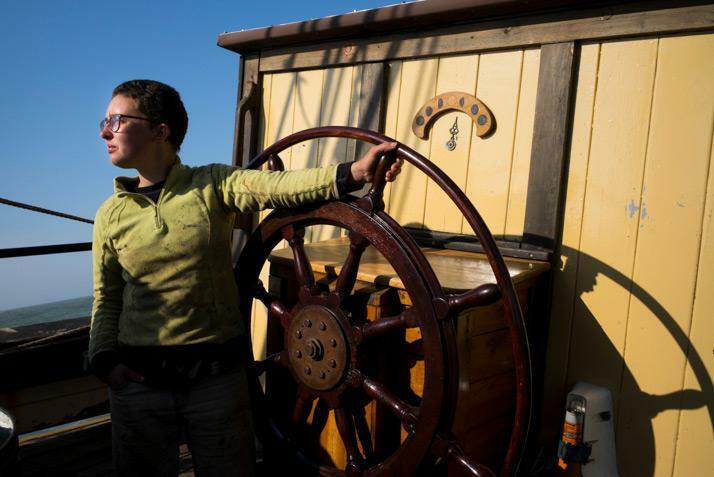 It takes a flexible, unselfish and pleasant person to be a successful crew member. We wake the cook at 06:30 to start breakfast and we wake the watch at 07:15, they eat and we swap watches on deck, then we eat breakfast and go to sleep. I sleep a few hours, but am ripped out of a dream at 13:15 for lunch. We eat, swap watches, they eat and sleep, I am finally getting used to the rhythm of the boat. The voyage was smooth with a good wind behind us so for the most part, they had little work to do apart from minor adjustments to the sails. At one point the Captain emerges from the navigation room with a big smile, and shouts across to the massive cargo ship half a mile off our port side, that we are doing 11 knots and nearly matching their 12. When we are going so fast the ship is heeling (leaning) with the power of the wind at what at first feels like an extreme angle, the waves slosh onto the deck every now and then. Sometimes when the wind drops and the current is against us we might drop to 4 knots, but everyone is always happy as long as we are moving forwards. “The rhythm of nature is our engine. 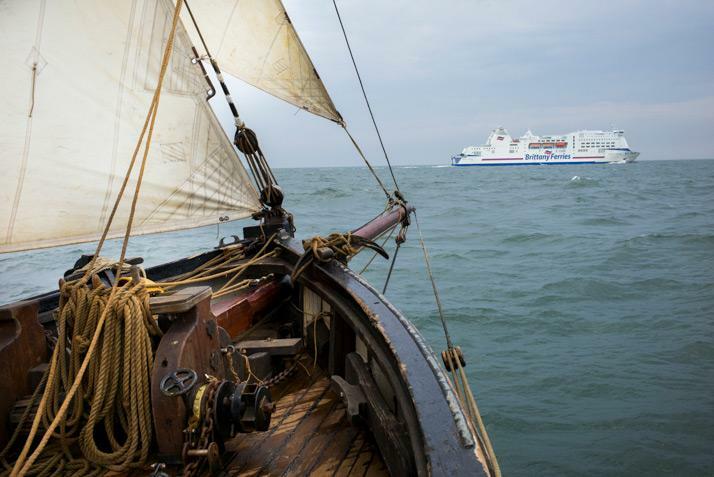 To sail a ship by wind means to respect the rhythm.” Nordlys Captain, Lammert Osinga We are crossing the world’s busiest shipping lanes, and there are huge cargo ships and car ferries dotted all around. We see lots of floating plastic, even some birthday balloons that floated away and now bob between England and France forgotten about. I do my first dog watch at 24:00, this is everyone's least favourite, as there is no sunset or sunrise, just darkness, but tonight is fairly clear and we have an amazing starscape to wonder at. The captain stops referring to the compass and starts aiming for stars instead. Eventually we spot a lighthouse we need to pass, so the last hours of the watch are spent slowly edging towards this growing light. I knead the dough and put it in the oven to rise, the next watch will turn the oven on and there will be bread for breakfast, everyone has to help out with preparing tea & coffee and cleaning the galley. I gain a greater appreciation for the cook who hand pumps the freshwater and cooks amazing meals, while his kitchen lurches from side to side. We sleep from 04:00 to 07:15 and when we wake up there is a beautiful sunrise and we are near the coast of England. We eat a quick breakfast and swap watches. The Captain informs the previous watch that they won’t be going to bed, but they will take the sails down once they have eaten. 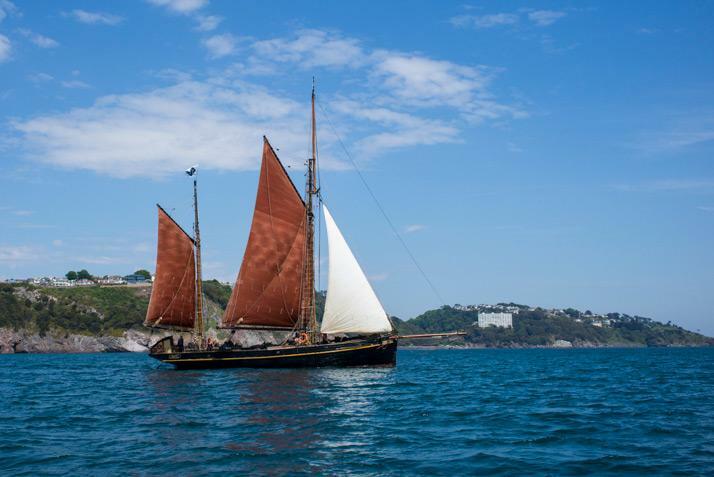 We drop the sails in reverse order, and slow down as the work boat comes out to meet us and tow us into Torquay harbour. We dock easily with all hands on deck pulling the ship to the quay. I was questioning my decision to sail along 40 hours ago and now I am sad to be back on land and miss the feeling of the sails being filled with wind, and the boat moving. 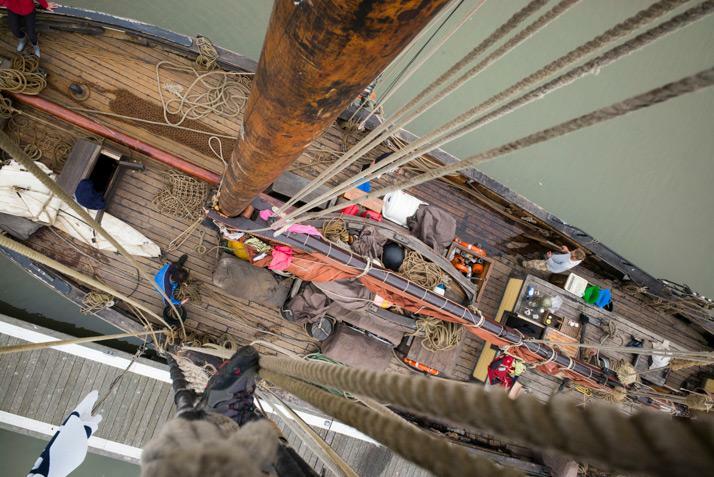 We are early so the unloading will happen on Monday, giving the crew some time off, but first the ropes and sails need to be packed carefully, the deck washed, bilges pumped and rescue suits aired and dried. We are finally finished sometime after 11:30, the previous watch has been working since 04:00, no one goes to bed and we share lunch and a bottle of wine to celebrate a safe voyage. Lots of people come by to the visit the Nordlys intrigued by the ship who is at least 100 years older than the other ships in the harbour, and amazed when they are told she is a working cargo ship. After a weekend of odd jobs on the boat, exploring the coastal paths and catching up on sleep the unloading starts early on Monday morning, taking advantage of the high tide that leaves the boat closer to the quay. 20 tons of cargo are unloaded by hand or using the 2 masts to winch heavy barrels just like the sails are moved. We are met by 3 sets of traders who take wine, olive oil, olives and sea salt to be sold in the UK. The Captain is the face of the company working with the traders in person and visiting local organic farms to meet the owners and view the production methods. The next day the Nordlys is made ready for sea and sets sail for Douarnenez in France to deliver and collect her next cargo. 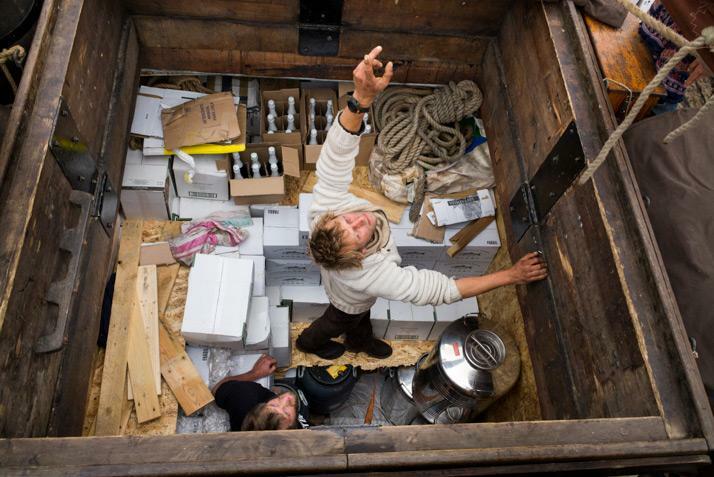 At first I struggled to understand what a sail powered cargo company could achieve, but now I see that they are part of a growing movement to bring a consciousness about our environmental situation. They are sacrificing a lot to be part of something special, and living their lives in a way to try and reduce their impact on the planet. Crossing the channel by the power of the wind was an amazing experience. 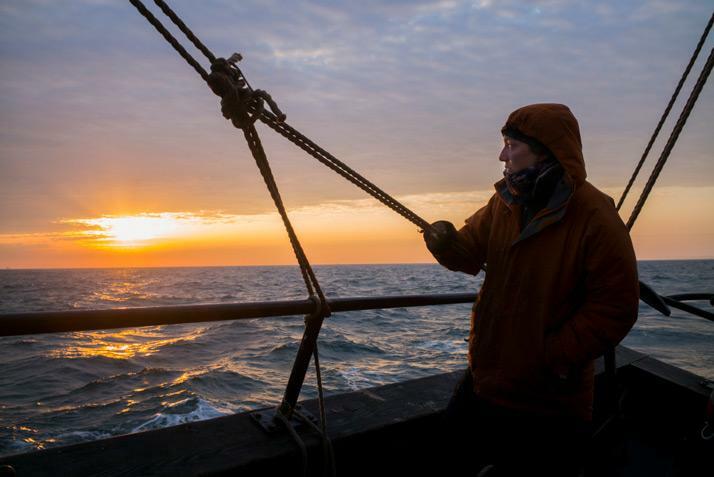 It is very strange to be alone in the middle of the sea at night thinking about all of the sailors who for hundreds of years have connected the world without the help of engines, GPS, radio and the coast guard. The next step for Fairtransport is a plan to build a brand new wooden Clipper ship to expand their fleet and deliver their message further around the world. Is this the calculated endgame for Japanese whaling?